Add the CAP Barbell 100 lb Weight Set with Chrome Bar to your home gym and expand your daily workout. It is ideal for a variety of upper-body and lower-body exercises and works well as a starter set for strengthening and sculpting all muscle groups. 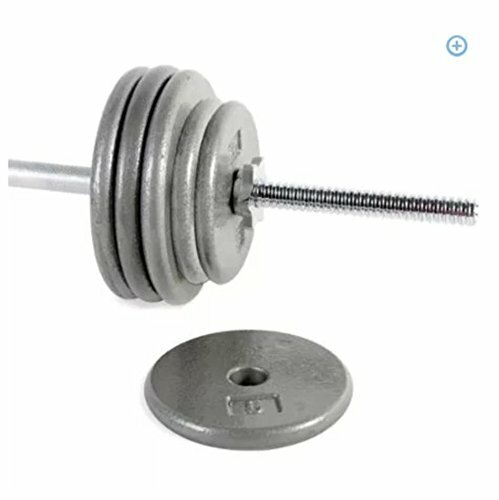 This cast-iron weight set comes with a 57" three-piece bar made of steel with threaded ends. It also contains six 10 lb standard plates and six 5 lb standard plates in grey. They feature a 1" hole and are made of solid cast iron. The included star collars are designed to spin onto the bar to keep weights in place as you work out for your safety. USA Sports Gray Olympic Plate - 100 lbs. Rubber Bumper Plate Black 5 Pair Set with Ader Plate Rack, Great Gift!